Judge Kimmel is originally from Omaha, Nebraska. He attended the University of Omaha and received a B.S.E.E. degree in 1959. At Omaha, Kimmel was a Regents Scholar. He also received the Hamilton Award and the Outstanding Engineering Student in Humanities award. Judge Kimmel received his J.D. (law) degree from the University of Denver in 1968. Judge Kimmel was admitted to the bar for Colorado in 1968. That same year, he was admitted to appear before the United States District Court for Colorado. A year later, he was admitted to appear before the United States Court of Appeals for the Tenth Circuit. He became the Municipal Judge for the City of Sheridan in October, 1975. 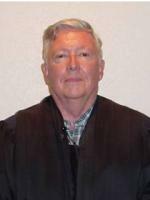 Judge Kimmel is member of the Arapahoe County Bar Association and served as President from 1976-1977. He is also a member of the Colorado Bar Association and served on the Board of Governors from 1973-1983. When Judge Kimmel is not on the bench for Sheridan, he maintains a private law practice. He practices in the areas of civil, business, estate planning, and probate law.